Posted by Ada Wang on 11/23/2018 5:18:26 PM. When asked about how to transfer ePub to Kobo, or how to upload ePub onto Kobo, the most common resolution those Q&A sites and forums given is copying ePub files to Kobo, right? But in my opinion I think the answer may be too simple to resolve problems for Kobo users. And this is also what I want to share in today's article. I will tell you the easiest way to transfer ePub to Kobo. And what you need to do is just to make sure where your downloaded epub file come from. Note: Following methods also works for PDF files. 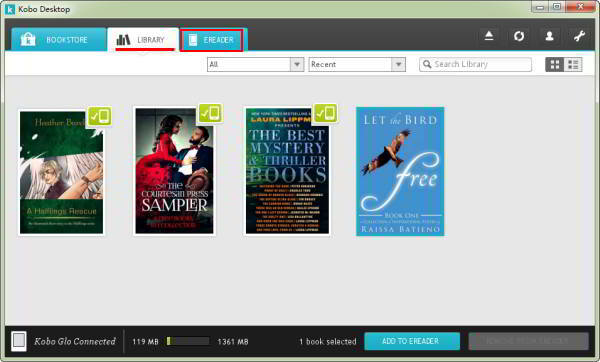 Case 1: Transfer Kobo ePub Books to Kobo with Kobo Desktop Reading App. Case 3: Copy DRM Free ePub Books to Kobo with USB. Case 5: Transfer ePub Books from Other eReader. If you have purchased a book from Kobo store, the book will be automatically synced to your Kobo eReader via wifi. All you need to do is signing in to your Kobo eReader with the same Kobo account. If your eReader can't connect to wifi right now or you have lots of books and it's too slow to sync via wifi, you can connect eReader to your computer and transfer books via Kobo Desktop Reading App - Kobo for PC/Mac App. When connect Kobo to computer, Kobo eReader will ask if you want to connect to your computer to manage files. After select “Connect”, Kobo device will appear ”Connected and charged”, and Windows can detect the new connected device. After opening your Kobo for PC or Mac reading app, you will find navigation bar "EREADER" is available, then click "LIBRARY", all your existing books will show up, including books currently on your eReader or computer. Click the cover of books which you want to transfer, then hit "ADD TO EREADER". The selected books will be transferred to your Kobo eReader soon. When all the books are transferred, eject your Kobo. Click "Library" in your Kobo eReader "Home"page. You will find books you have just added. Infact, you can't transfer Kobo ePub Books to another Kobo eReader directly, since the book is Kepub file and protected by DRM. Fortunately, there is a useful tool Kindle Transfer, which can help you make it. 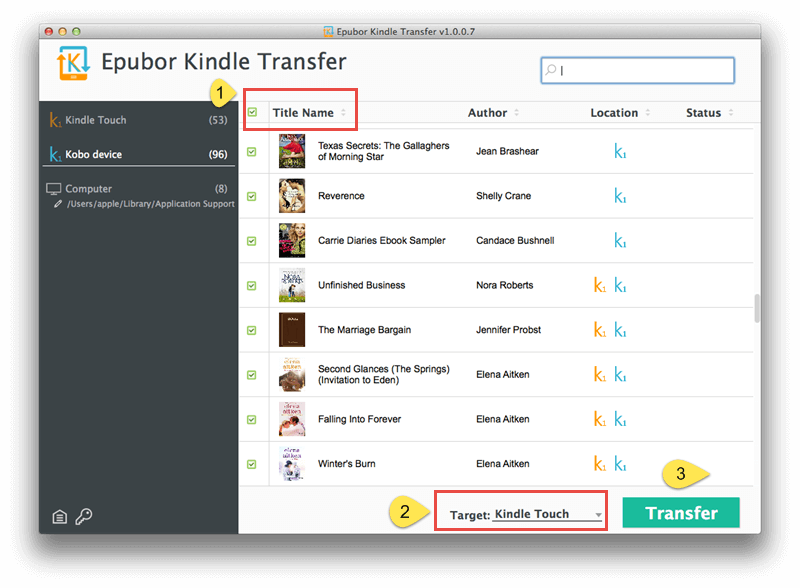 With Kindle Transfer, you can transfer ePub books between two Kobo eReaders. You can also use this tool to transfer books from Kobo to Computer or computer to Kobo eReader. It is easy to use, just connect the two eReader to your computer with USB cable, select eBooks which you want to transfer, and choose target Kobo device, then click "Transfer" button; Within a few seconds, books will be transferred to another eReader. You can also use this tool to transfer books from your computer to Kobo eReader. Note: Kindle Transfer can also transfer Kindle books to Kobo , or between Kindle to computer, as it's name suggested. If you have downloaded some DRM free ebooks from the internet, such as torrent site or free ebook giveaway website, the easiest way to transfer them to your Kobo is copy them with USB. Step 1: Connect Kobo eReader to computer using USB. Tap "Connect" in your Kobo device. Step2: Open "Computer" in your desktop. Double-click "KOBOeReader". Then it will show the contents of your eReader. 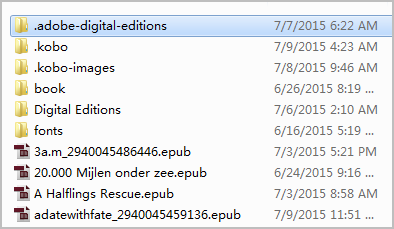 Step3: Open another folder which saves your ePub books or PDF files. Then just drag books which you want to transfer to your Kobo eReader contents folder. 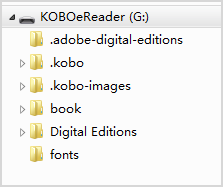 Note: For you own Kobo books, the folder is hidden on your computer as default, you need to change the folder option to make the hidden files and folders visible. For acsm files, you have to open them with ADE to convert acsm to ePub first, then transfer them to your Kobo via USB. (Kobo must be authorized with the same Adobe account). If your ePub books are purchased from Google Play books, Kobo and Sony website, or other online ebook stores, and even Barnes & Noble, you can use Adobe Digital Editions to add ePub books to Kobo, especially for Adobe DRM protected books. Step1: Install Adobe Digital Editions, and then authorize with the same Adobe ID (the same email address as your kobo account). Step2:Connect Kobo eReader to your computer. ADE will detect your device automatically. Step3: You can click "File"-->"Add to Library" at the upper left corner to add books you want to transfer. Or just drag your EPUB books to the main interface of ADE. Note: If you find an ebook with .acsm extension, it is protected by Adobe DRM, so you need to convert acsm to epub at first. Step4: Select your epub files and drag them to the Kobo eReader bookshelf (listed on the left side under Bookshelves). DRM protection limits you to use the same Adobe ID within your accounts. So if you think it a little annoying, you can search the Internet and find a good tool that can help you remove Adobe DRM. You can use Calibre DRM Removal plugin, if you are an professional computer user. Or some other easy-to-use tools with better user-friendly interface. Of course there are many softwares. Here I recommend All DRM Removal to strip the DRM from ePub books. Just try the free version of All DRM Removal and run it on your computer, drag ePub books to the tool's main interface. Then click the "Remove DRM" button to get your DRM free epub files, and then copy them to your kobo ereader from ADE, or with USB cable. With All DRM Removal you can transfer DRM protected ePub books to Kobo. It's the easiest way and the best way because you don't have to check whether your ePub books are DRM free or DRM protected. There is no need for you to check which DRM your books are protected by. It supports Adobe DRM removal, Nook drm removal, and even Kindle drm removal. It helps you transfer epub to Kobo, and even transfer ePub to Nexus 7/ Android tablet/ Nook/ iPad/ iPhone, etc. 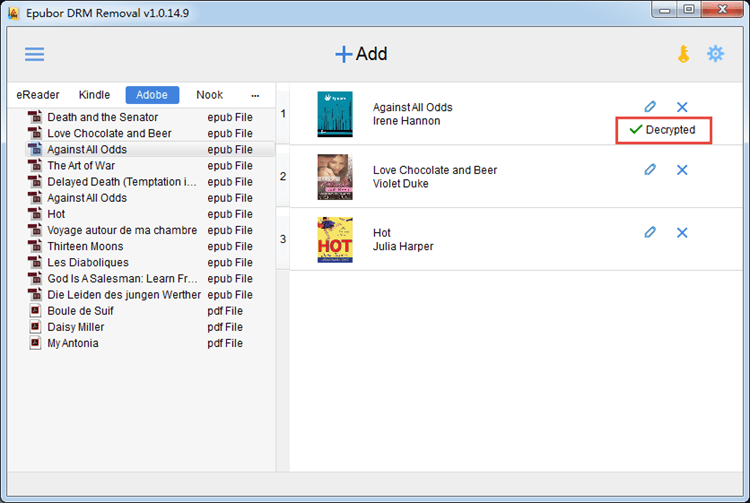 Transfer Nook ePub books to Kobo eReader. If you want to upload Nook eBooks (EPUB or PDF) to Kobo eReader, you need to remove Nook own DRM protections at first, then add the DRM free books to Kobo. You can use All DRM Removal to remove nook DRM as I suggest before. 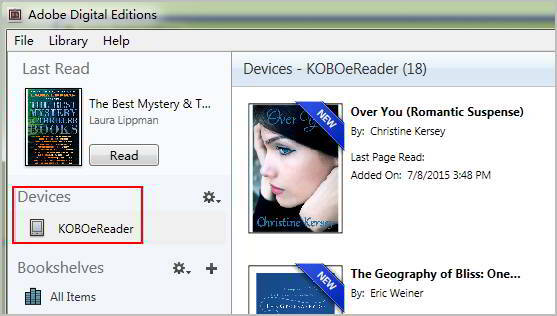 Transfer Sony ePub books to Kobo eReader. According to Kobo's declaration, in March 2014 all the US and Canada Sony eReader users will have the authority to transfer most of their purchased Sony eBooks to Kobo library, and in May, they will be able to directly buy eBooks from Kobo store via Sony PRS eReader devices, but PRS-900/950 are not included. Transfer Kindle books to Kobo eReader. Kindle Books are not ePub format and also protected by Kindle DRM, so you can't transfer them to Kobo normally. But there is a way to do it. If you have feedback or suggestions on issues to include, please feel free to write them in the comments. I have a large collection of books on my Kobo Aura. I've noticed, though, that all the books I buy at the Kobo store put two copies on my reader; one is a Kobo ePub edition, the other is just epub. Is there a way I can clean this up so I only have one copy on my reader? I have many books from a subscription site i want to read on my Kobe reader. I can read them on my Android and see them in my Kobe Android reader app. How to get the books to appear on the reader. I have uploaded them to the Android Kobe reader app library. I expect it works fine as long as ADE knows that your reader is connected. I haven't had that experience yet. Não consigo passar para o meu KOBO o livro que acabo de adquirir e que paguei por PayPal: A Primeira Aldeia Global. O Vosso telefone para assistência técnica 08000474933 não funciona. ADE works fine, the library books are there, when I transfer them to the Kobo, the window shows up, but the bar does not turn green, and the book never shows up in my Kobo. This is happening for all library books, for the past 6 weeks. I have re-installed ADE (3) already, as the newer version caused worse problems when I tried it earlier this year. Been using 3 without any trouble until this happened. The books are ones I have previously read on the Kobo, so I know they are authorized.